According to a press release on the university’s website, the student centre is to serve as a hub for student life on campus and be a ‘home-from-home’ for students. The centre will house the MSU, clubs, societies and events. Maynooth University has finalised plans to construct a new student centre and in conjuction with Maynooth Student Union (MSU) the first stage of construction was signed off on January 23rd. The student centre will be built as part of Maynooth University’s campus development plan. The plan aims to meet the needs of students, staff and the wider community by providing important campus buildings and infrastructure. The university and MSU announced in April 2018 that they had appointed a design team to begin work on the centre. The centre is being designed by Scott Tallon Walker Architects, who also worked on the library, Iontas and other buildings for the university. The centre is to be built and operated to the highest sustainability standards. It will include an outdoor living room, which will be under an environmentally friendly canopy, the aim of which is to create a unique space and resource for student life. 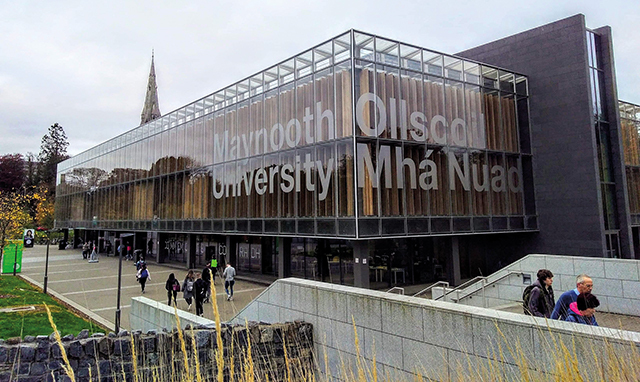 “The new Student Centre will provide a proper home for the Maynooth student experience, one that reflects the ambition of our students and the type of experience we want them to have while studying here,” said Maynooth University President, Professor Philip Nolan. The budget of the construction is €7 million and will be finished within five years. 88 per cent of Maynooth University students voted in favour of paying a €30 levy to help pay for the student centre. The construction of the new student centre is set to be finished and opened for use to the students by early 2021.